Cheap flights to Greece can be easy to find if you know a few tips and tricks. Here are some ways to save money on your next flight to Athens, Greece. 1. Book early or late. You can save money by either booking way early, 60 to 90 days in advance, or by booking late with last-minute deals. The latter is only for those travelers with nerves of steel and flexible schedules. 2. Break it up. Concentrate on getting a great price to London, Paris, Rome or Munich. From there, then find a flight to Greece on a smaller European airline. 3. Be flexible. Be willing to travel any day of the week. If your schedule permits, check a day or two before your optimal arrival and departure dates. 4. Consider other airlines. Check who is flying to Athens International Airport near your departure date; you may notice a newer or smaller airline that is offering promotional fares. You may also find a European regional airline that you never thought of taking before. 5. Take a tour. If you're thinking of taking a tour or cruise, see what airfare deals your tour operator offers and find out if you can extend your trip to allow time for independent travel before or after. 6. Fly direct. Consider flying directly to Kerkyra (Corfu), Thessaloniki, Rhodes, or through Chania or Heraklion on the island of Crete. Airlines flying out of Britain and Germany have many direct flights to these locations. 7. Try an "open-jaw flight." 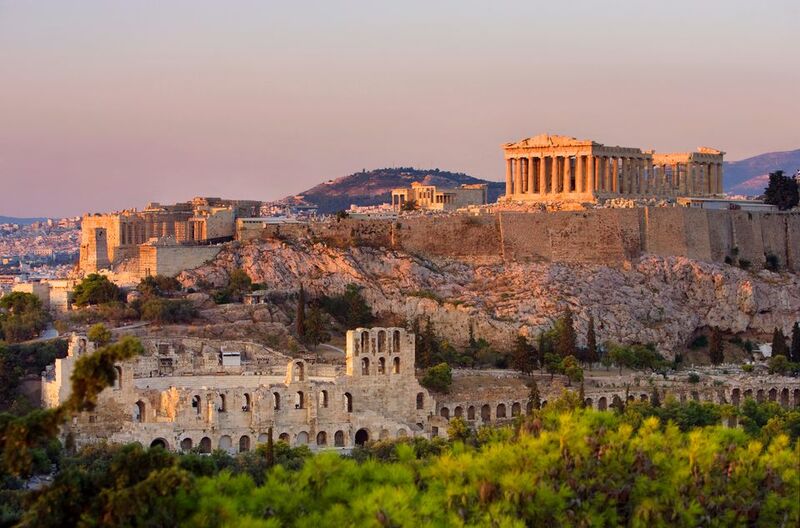 Go into Athens but fly home out of Heraklion, Rhodes, Thessaloniki or Kerkyra. 8. Comparison shop. Check three to five different resources before clicking that "pay" button. 9. Call the airline directly. Find a great price on a particular airline using a travel search? Call the airline directly and ask if there are any other special promotions to that destination. Most of the time, the price posted on the internet will be the lowest, but not always. But if the airline charges you a fee to talk with a reservations agent, it's probably not worth it. Similarly, if you've searched out a good price, and talked to the airline, compare both results to a direct search on the airline's own website. You may be surprised. 10. Search red eye. Search in the middle of the night. Supposedly, many new prices go into effect at midnight or thereabouts, though time differences may make this magic moment a little obscure. Many search engines may give you the option of searching for flights to an alternate airport "near" Athens or other locations. There aren't any. Searches for Athens may suggest you look for flights to the island of Mykonos; it's only 94 miles away from Athens, but that's all water, requiring either a slow ferry, a more expensive hydrofoil or another flight over to Athens. Other searches may suggest flying to the island of Santorini to get to the island of Crete, "only" 70 miles away. The sole exception for airport substitutions is for flights to Crete. There, flying into the Chania Airport rather than Heraklion could work; you're at least on the same island. Book direct:. Travelocity provides flights and vacation packages to Europe, including many Greece options. Europebyair.com: This page specializes in finding deals on less-known regional airlines. It's a great place to locate cheap flights that just won't be shown on the "big" comparison engines. Bootsnall: This page shows consistently low fares on flights to Greece. Booking Wiz: This website, also affiliated with Bootsnall, allows you to check most of the "big name" travel providers with just one entry of your flight information. Still don't like what you find? Run another search at the individual providers and you may get additional results. Aegean Airlines: Aegean operates only in Europe but has codeshares with other airlines. It has overtaken the old Olympic Airways in the number of passengers it flies annually. Aegean also has a codeshare agreement with Continental Airlines for flights to Greece. Olympic Air: Check the bargain page. Greece's carrier sometimes offers discounts, and these can be good deals. The site has also streamlined its online booking system. International flights are mostly codeshares. Delta Airlines: This airline frequently promotes flights to Athens. KLM: Another airline often offering low fares to Athens. Almost forgotten in the internet shuffle are traditional travel agents. Often, they will have access to flight deals from consolidators that can meet or beat posted prices elsewhere, and sometimes it's nice to have a real human to help with your trip details. Most of them charge a ticketing fee in addition to the ticket price, but it's usually pretty cheap. Have to save those last few dollars? Instead of taking a taxi from Athens Airport to your hotel for 45 Euro (give or take), take the 4 Euro (or so) Airport Bus or the Metro into Athens instead. Then take a taxi if you must to your exact destination. You'll haul your luggage a little more, but you'll save big bucks over taking a cab.